Hey, long time no see. I’ve been quite the neglectful blogger lately. Sorry guys. It’s been a whirlwind of a week. I had Friday off work for a doctor’s appointment. Just a typical physical, I had to fast for some blood work which made me quite the cranky little girl. I don’t understand how people don’t eat breakfast. I didn’t get to eat until 11 and I was DYING. I don’t do hungry so well. The doctor took some blood for lab tests and they were having trouble finding a vein, so the lab technician had to poke around my arm to try to find one. Yeah, not fun, except while this was happening the lab technician was telling about the time her brother got shot in the head. No joke. Um, okay, maybe my arm doesn’t hurt that bad. 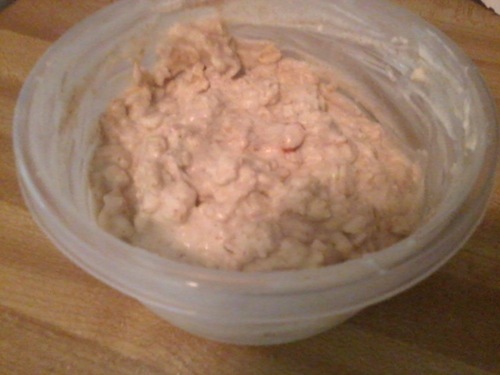 Overnight (actually early morning) oats, plain greek yogurt, vanilla whey protein powder, soy milk and cinnamon, I think this is the first time all summer I haven’t eaten peanut butter oatmeal. Changin’ it up. It was delicious but not the same. My mom took out for lunch at Neomonde, a nearby Mediterranean restaurant. Neomonde is set up kind of like a deli, you can order plates of different sides, wraps, and kebabs, but they also offer food by the pound and lots of packaged Mediterranean goodies like dried fruits, breads and dairy products. 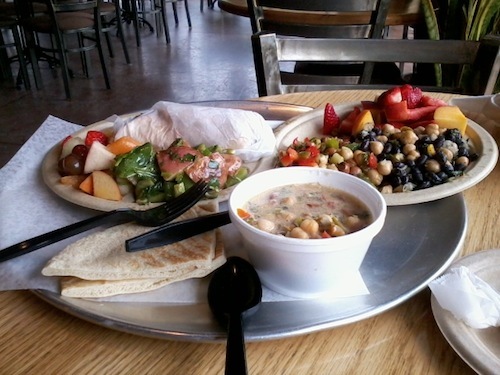 I ordered a plate with fava bean salad, black bean salad, foul, and fruit salad. Mom got the plate on the left and the pita. I totally didn’t realize that my lunch was almost 100% beans until I sat down to eat. Whoops. Luckily I like a little fiber in my diet. My plate was totally demolished, I was clearly a little hungry. Neomonde’s is always a winner for quality food. 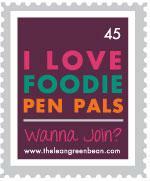 Their food is wholesome, delicious, and very vegetarian friendly, and sometimes they give us free baklava. Bonus points. I also had some unpictured fro yo. Tart flavored with bananas, a small sprinkle of dark chocolate chips with a smidge of peanut butter sauce. So good. I can deal with getting my arms stabbed if it means free frozen yogurt. Saturday morning I was headed to the beach! I don’t have many pictures, because I was busy living life, but work with me here. For lunch I stopped by Whole Foods for some salad/hot bar deliciousness when we got into Wilmington. We made a McDonald’s stop for my friends earlier along our trip, so I was free to pick a super healthy/hippie spot for lunch. We passed a billboard for Whole Foods so of course I had to stop. The store was twice the size of the one back home. Heaven. I filled my take-out box with tofu, a superfood salad and steamed veggies. But I neglected to take a picture because I was hangry after the two hour drive. Yes, I struggle to go without eating for 2 hours. I like food. I did stumble across this magical treasure. A trail mix bar. AKA what dreams are made of. I resisted though and my wallet and waistline are thanking me. From Whole Foods we headed to Carolina Beach for a couple of hours of beach time. It was wonderful. The water was warm and it was a perfect 85 degrees. Despite my pale skin, and lack of ability to swim I still love the beach. It’s such a peaceful place. 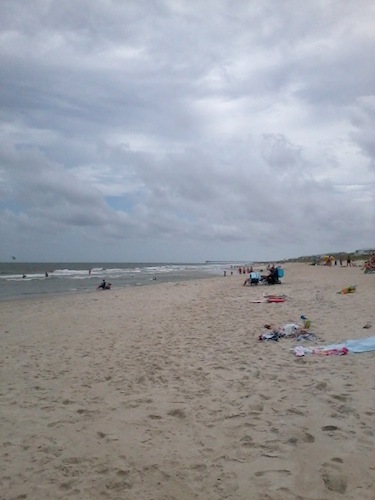 Although our actual beach time was cut a little short thanks to a storm that was brewing and some intense wind. Strong winds and sand make a really great combination if you don’t like having skin. It was my goal not to get burnt this year. Total failure. 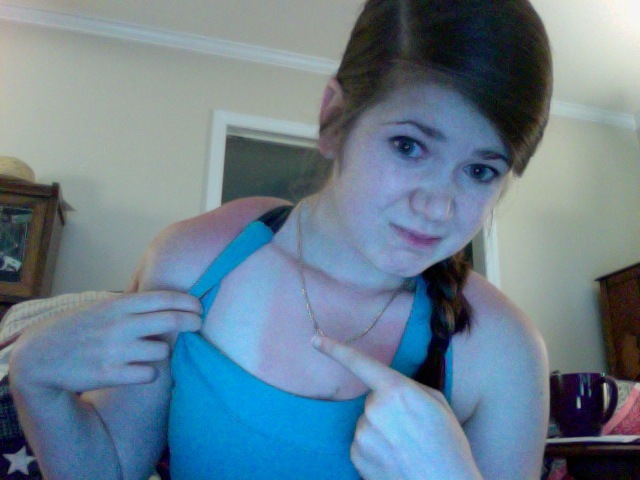 I forgot to put sunscreen on my entire chest/front of my shoulders. I’m such a genius sometimes. 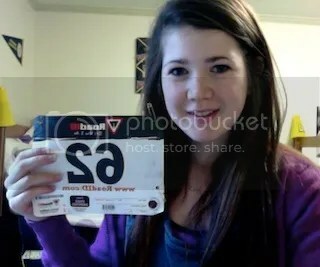 Racer backs are currently the only thing that don’t hurt, so I think I’ll be living in a sports bra for the next week. It’s better than last year when I got burnt all around the back of my bathing suit bottom. Not recommended. What’s up Casper. After the weather took a turn for the worse, we headed back into Wilmington to grab some dinner before leaving town. My friend Lizzie works at the Mellow Mushroom in Wilmington so naturally we had to eat there. 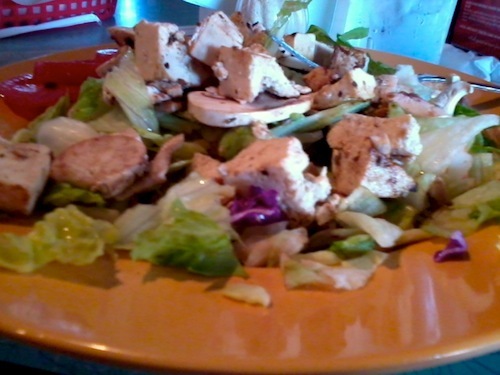 Not to mention Mellow Mushroom is awesome and very vegetarian and gluten-free friendly. It was only 4:00 pm (we’re a bunch of grannies) so we basically had the restaurant to ourselves, it was great to get a chance to catch up. But not quite. Tofu, artichokes, mushrooms, cucumbers and tomatoes over lettuce with balsamic vinegarette. Tasty. After dinner we headed back to Raleigh, armed with an iced coffee for the drive. By the way. 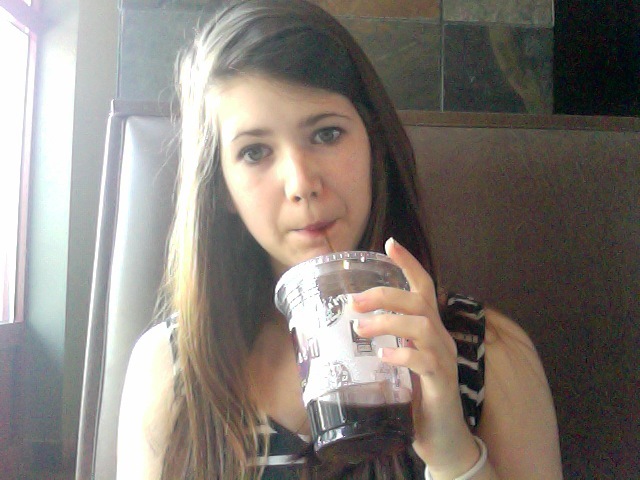 iced coffees are a poor choice for road trips. Your bladder will not be happy. And fro yo was necessary when we got back to Raleigh. Duh. I dropped off one friend and my roommate and I met up with her boyfriend at Freshberry near NC State’s campus. It was a little over priced, and the topping selections were pretty slim, but it was still tasty. But, I don’t think I’ve met a frozen yogurt I didn’t like. Tart flavored with fruit, again. So predictable. Then I was a lazy bum on Sunday. 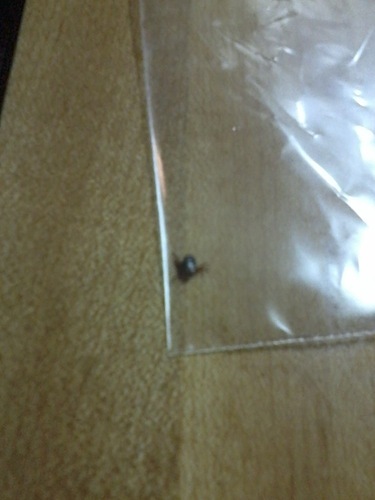 I found a tick on my head though. I don’t even know how it landed on me because I haven’t been in the woods or anything, but now I’m incredibly grossed out. Luckily it looked like it hadn’t been there long. Grossgrossgross. What’s your favorite pizza restaurant? I love Mellow Mushroom’s pizza. Good stuff. 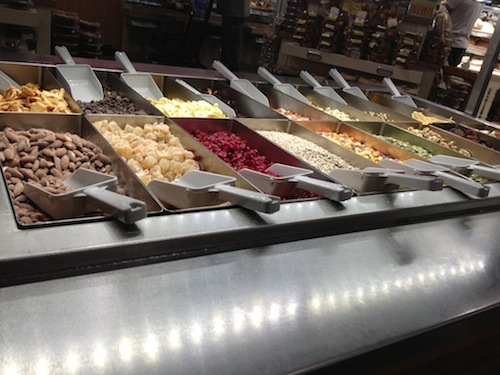 A trail mix bar!!!! It would’ve been hard to resist; well done! It was! It helped that I already had a big box of salad in hand.